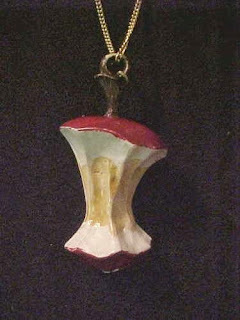 Apple core necklaces -- for some reason these were all the rage in the late 1970's. Everyone wore them. Fruit themed jewelry was popular with preteen and teen girls; I'm not sure why. It would be interesting to find a few Seventeen magazines from this vintage and look through them for trends like this. Do you remember these necklaces? This is one retro trend that I don't want to repeat. Wow...I had completely forgotten about these necklaces. I do remember the girls wearing these when I was in school.